We're highlighting these fascinating women because of their positive, focused and undeniable hunger to succeed. A true testament of what a Latinista is, can and will be. Claudia M. Valencia has more than 15 years of information technology experience in the Investment Banking industry. As a Technology Infrastructure Project Manager, Claudia oversees technical projects related to Corporate Real Estate, Facilities and Data Center build-outs. Through leadership and commitment, she ensures that all aspects of technical projects, from initiation through delivery, are on schedule, within budget, and with the appropriate quality standards for the project scope. Claudia leads large teams with budgets up to a $1,000,000. She is a graduate of Boston College, where she obtained her B.S. in Information Technology and Marketing from the Carroll School of Management. Born and raised in El Salvador, and not speaking a word of English, Claudia came to the U.S. as a teenager and as a Political Refugee, after surviving the Civil War in her country. Claudia is actively involved in her community as a mentor and volunteer. During her spare time, she is passionate about being part of a dance team, active health and fitness advocate. and a #Latinista! Claudia is also a real estate investor and is currently working on obtaining her PMP certification as well as a working on her Health and Fitness blog under company Ideal Vida LLC. Link in with Claudia here. Sarah Khan is an insurance professional and technology enthusiast. An archaeologist by training, Sarah's passions range from philanthropy and volunteerism to data privacy education. Sarah began her career in technology as a sales consultant at Uniteller, a Mexican fitech, now part of Banorte. She gained a holistic understanding of the insurance industry at Advisen, an insurance analytics firm from 2007-2009. In 2009 she joined The Hartford as a cyber liability underwriter. Creative and inquisitive she saw the potential for new cyber products and joined CloudInsure, an insurance start-up, in 2011 as managing director. She traveled through Europe and Mexico as a Cloud Computing, Data transfer and SAP technology consultant for the following 2 years. In 2014 she was lured back into the insurance industry to help establish and build AXA Insurances' U.S. E&O practice. Sarah resides in Madrid, Spain and in her spare time, she is an avid painter, traveler and salsa dancer. She is proud of her Cuban and Pakistani heritage and is a native English and Spanish speaker. Link in with Sarah here. Ivana joined BNY Mellon in March 2017 as a Senior Associate within Operational Risk and Control at Pershing. She is responsible for analyzing Key Risk Indicator data from business units, reviewing Risk Management reports and currently working on Bank Custody and Risk Control Self-Assessment Enhancement initiatives. Her past experiences include being a Compliance Specialist at a Healthcare IT company, performing Medicaid audits on homecare agencies, as well as working with KPMG and major health organizations across the NYC metropolitan area for the purposes of Regulatory Requirements for Meaningful Use and Delivery System Reform Incentive Payment Program (DSRIP). Ivana is an active member among the employee resource groups IMPACT (for Latinos) and WIN (for women) member at BNY Mellon in addition to The Latinista and the Association of Latino Professionals for America (ALPFA). Ivana holds a B.A. in Psychology from Gordon College. Link in with Ivana here. Cathy joined Latinista in the Fall of 2015. She is entrepreneurial-spirited and design-centric. She is the President & Creative Director of Lacia Design, a branding studio that works primarily with beauty and children’s brands in the creation of marketing materials. This includes mostly logo and packaging design, along with marketing collateral, signage, advertising, and web design. Cathy also loves drawing, painting and sculpture—a passion she has had since early childhood. She loves animals, and does volunteer work for NJ Sheltie Rescue, taking part in fundraisers and managing the organization’s Facebook page. She has trained her own Sheltie, named Casper, in obedience, agility and nose work. Cathy enjoys all types of fitness from kickboxing and Pilates to strength training and dance. She loves fashion and beauty, and owns many nail polish colors! Her guilty pleasure is watching an excessive amount of YouTube videos. Cathy is a first generation Cuban-American on her mother’s side, and she plans to visit her mother’s homeland within the next few years. Cathy loves celebrating all aspects of Hispanic culture, from the food (finding creative vegan alternative recipes!) 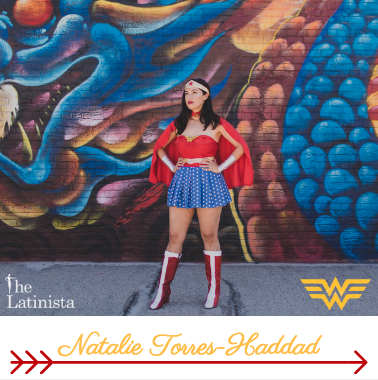 to art and dance, and the gregarious spirit of Latinas! Link in with Cathy here. A movement designed to highlight brilliant and resilient women around the world. We are brave, intellectual, powerful, and beautiful - we are all Wonder Women. Help us share their stories by clicking here.